Widely renowned as a training maestro, Newmarket handler John Gosden’s UK career has spanned over four decades. Articulate, thoughtful and extremely skilled, Gosden has had great success in the flat sphere, training multiple Group 1 and Classic winners. Like every trainer, he displays trends and biases throughout the season, which can be very useful in helping to know when to back and when to lay his runners. Gosden can most definitely get his 2 year olds ready to win at the first time of asking, but he shows a clear bias to the summer months for his debut winners. May is not the time to be following the trainers 2 year olds, but from June to September, they show a healthy strike rate and a positive A/E on turf. As the season comes to a close, his strike rate and returns diminish (October and November), and this is the time he tends to give his backwards 2 year olds a run to get some racecourse experience, whilst ultimately, the real focus is on their 3 year old career. 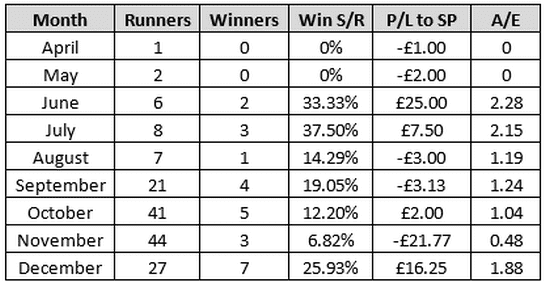 Gosden doesn’t have many all-weather debutants, but again they do well throughout the summer and then perform particularly poorly in November, before picking up again in December. March, April and May are the time to catch the Newmarket maestro, and his performance gets progressively worse as the year goes on. March-May is when Gosden’s 3 year old debutants should be followed. John Gosden can be classified as one of the ‘old school’ who generally likes to bring along his horses so that they improve as the season progresses. That being said, although he rarely has handicap runners at the very start of the season (March/April), when he does, they do well. As the racing gets more competitive in May and June, he does poorly. Improvement is forthcoming as the season progresses, and August to October is the time when Gosden’s runners thrive and outperform their odds, winning at a high percentage and producing big profits. Many trainers exhibit performance biases when it comes to the amount of time their horses have spent off the course, and John Gosden is no different. 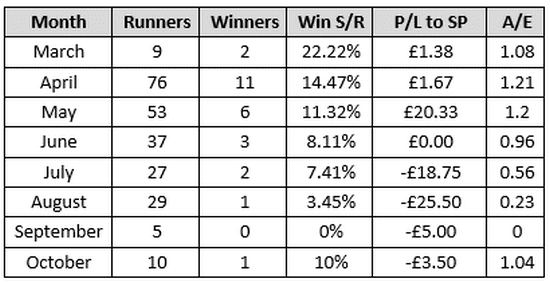 As his non last time out winners have longer off the track, they improve in terms of win percentage, profit and A/E. With such experience, Gosden is able to freshen them up and get them fit off an absence. When turned out quickly, they don’t have a fantastic record. The Newmarket trainer struggles with his 2 year old debutants in May, but does very well with them June-September. Early season is the time to catch Gosden’s first time out 3 year olds – their performance gets poorer as the season progresses. 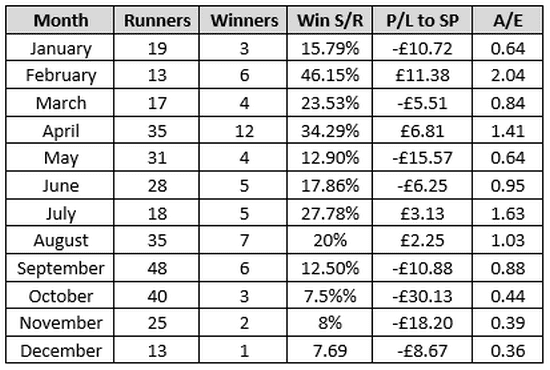 Handicap runners are poor value in May-June but have a fantastic record August-October. Back his all-weather runners in February- April and avoid them October-January. 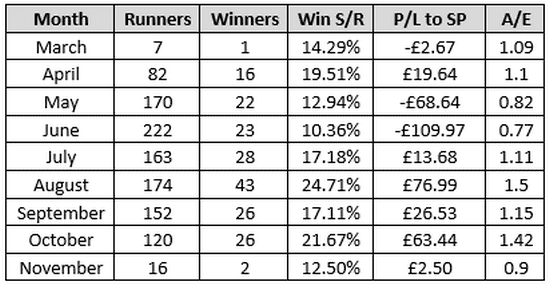 Gosden’s runners who did not win last time out are generally better value the more time they have had off the track.